9 out of 10 people suffer from the fear of losing power on their phone. Aircharge wireless charging connects you with consumers in search of charging facilities and drives them to your restaurant, fast-food. 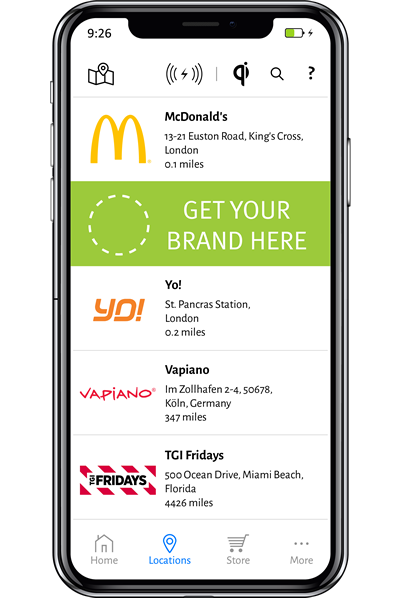 The Aircharge app allows users to locate the closest Aircharge locations and select their favourite brand to visit. Drive footfall to your venue and monetise from dwell time in 5 easy steps. The average Return on Investment on installing Aircharge wireless charging is 3 months. From world’s leading fast food and quick service chains to independent restaurants, the most renowned brands in the Food & Beverage sector are deploying Aircharge wireless chargers to redefine and enhance their mobile experience.